These helical gear reducers, adopting a hollow output shaft, can be directly mounted on the driven shaft. Self-centering. Mounts in any direction. Easy to install. Available with a straight shaft or tapered bush. The following mounting variations are available. Specify the mounting position by number when you place your order. Contact us about delivery times for special mounting styles. Also contact us if the unit is to be inclined ± 10° more than the positions given below. This will change the oil level and the location of the bulls-eye gauge and each plug. ＊ If mounting type is not specified, the delivered products will be of the type in Mounting Example 1. This shows the bore diameter of the output shaft. This shows the rotating direction of the output shaft as viewed from the input shaft. Taper Bush are made-to-order. Contact a Tsubaki representative for more information. 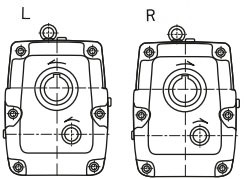 Looking at the reducer from the front (input shaft side), reducers with the output shaft rotating in the left-hand direction are indicated as "L" and those with the output shaft rotating in the right-hand direction are indicated as "R".